This is how low the NFL has sunk. It is no longer about America’s favorite sport. It is about a radical leftist agenda. NFL players are no longer simply overpaid, entitled sports figures, they are social justice warriors, apparently not bright enough to connect the dots between their own stupidity and bankruptcy. 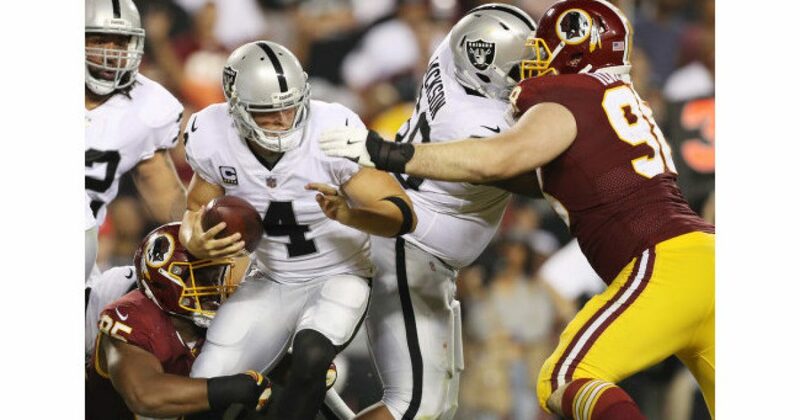 The starting offensive line for the Oakland Raiders is known for several things. It is among the finest offensive lines in the National Football League. It is also the only offensive line in the NFL composed exclusively of black players. Reports from reliable sources, one a starting offensive lineman for the Raiders, are revealing that last Sunday’s game (9/24) was thrown by the offensive line to spite their quarterback, who they are paid to protect, simply because he stood for the national anthem. If this is confirmed as true, those linemen should be thrown out of the league and never allowed to return. Also, if this is confirmed as true, the NFL has a much larger problem than they ever imagined. And just minutes ago, Carr was sacked and hurt by the Denver Broncos defense, who appeared to be allowed to rush into the backfield and crush Oakland’s star QB. I just tuned into the Oakland/Denver game. Carr is out for the game with a back injury from a vicious sack. His backup, Manuel, who is black, was given outstanding protection from the offensive line and marched the team right down the field for a field goal, which would have been a touchdown if not for three dropped passes. This is absolutely sick, and by all appearances, true. Correction: In the first edition of this article we reported that Derek Carr was not sacked at all in 2016, which was information provided in a source document. Carr was actually sacked 16 times in 2016, an average of less than once per game.